Home / Technical Articles / What Is Modulation? Modulation is the use of one electrical signal to “control” a primary variable of another. For example, if an audio signal voltage is used to control the “amplitude” of a carrier signal, the result is amplitude modulation. It is important that you do not confuse “mixing” with “modulation.” Mixing occurs when two (or more) signals are simply combined in a linear network. Modulation, however, requires one signal to “control” a variable of another; variables such as the amplitude of an RF signal [amplitude modulation (AM)], the frequency [frequency modulation (FM)], the pulse width [pulse width modulation (PWM)], the phase [phase modulation (PM)], or the pulse code [pulse code modulation (PCM)]. If the two modulated signals are sinusoidal, the beat frequencies will be the sum and the difference of the original frequencies. AM radio broadcast transmissions contain two signals of primary importance to the user: the carrier signal and the audio signal, or the program signal. The carrier frequency is the frequency to which the radio receiver is tuned for station selection. For example, the AM radio band (also referred to as the medium-wave broadcast band, or simply the broadcast band) is legally designated from 535 to 1605 kHz. If your favorite local radio station broadcasts on 830 kHz, this means that the carrier frequency being used for transmission is 830 kHz. 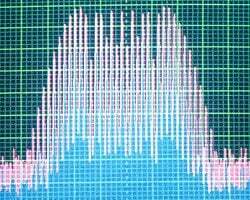 The audio signal, or program, is riding on this carrier frequency. Figure 1 illustrates an amplitude-modulated waveshape as it would appear when picked up by a radio antenna. Notice that the carrier frequency is much higher than the program signal riding on it. In actuality, there is not a literal program signal “on top of” the carrier. When the AM signal was broadcast, the program signal modulated the amplitude, or the level, of the carrier; this process formed an “envelope” of carrier amplitude, having the same shape as the program signal. The “beat” frequencies, contained within the AM waveform of Fig. 1, will be the sum and the difference of the carrier and its program signal. For example, if the program signal were a constant 5-kHz tone, with a carrier frequency of 600 kHz, the beat frequencies would be 595 kHz (difference frequency) and 605 kHz (sum frequency). In a typical AM broadcast, the program signal will contain vocal and music information, making up a very wide range of frequencies. The highest frequency, of this range of frequencies, will determine the maximum separation of the beat frequencies from the carrier. For example, if the highest frequency in the program signal was limited to 1 kHz, then the beat frequencies would be 599 and 601 kHz. However, as you can see from the earlier example, when the highest frequency is limited to 5 kHz, the width (or distance from the carrier frequency) increases. The range of beat frequencies above (and below) the carrier frequency are called sidebands. The width of the sidebands is closely monitored at AM broadcast stations because, if they become too wide, they can interfere with adjacent stations. Frequency modulation (FM) radio signals also have a carrier signal and a program signal. However, the program signal does not ride “on” the carrier frequency; it is contained “within” frequency variances modulated into the carrier signal. Because the program signal is not dependent on carrier amplitudes (as are AM transmissions), FM radio is largely immune to many forms of interference. Figure 2 illustrates an exaggeration of an FM-modulated waveform. Hi Eddin, well done for helpfully explaining the difference between mixing and modulating! However, you then went on to talk about “beating”. Two signals beat when they are added together (i.e. mixed”), not when they are modulated! Beating occurs because two signals of similar frequencies when added together fade into and out of sync with each other. When they are 180° out of sync they cancel each other out, and when in sync they combine, giving the characteristic “beating” sound.